Tag line: "A cast as explosive as its story!" The first time I saw John Huston’s Key Largo was back in 1984, on a day I was home sick from school, and as I sat watching the film, I found myself so caught up in its energy and feisty dialogue that I completely forget I was sick as a dog. 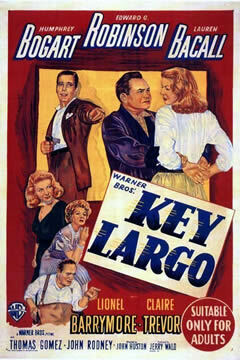 Clearly, Key Largo was the perfect remedy for whatever it was that was ailing me that day! Former Army Major Frank McCloud (Humphrey Bogart), a veteran of World War II, travels to Key Largo, Florida, to visit the relatives of a buddy who was killed in battle. James Temple (Lionel Barrymore), his friend’s wheelchair-bound father, owns a first-class hotel on the Keys, and his daughter-in-law, Nora (Lauren Bacall), helps him run it. Mr. Temple invites Frank to stay for the night, but unbeknownst to the three of them, some shifty strangers have also checked into the hotel; a gang of thugs whose leader is none other than the notorious mobster, Johnny Rocco (Edward G. Robinson). A lifetime crook, Rocco had been banned from ever returning to the U.S. mainland, and now plans to rejuvenate his criminal empire south of the border in Cuba, far from the U.S. Government’s jurisdiction. But his scheme is temporarily thwarted when a violent hurricane paralyzes the Keys, trapping Rocco and his men, as well as McCloud and the others, in the hotel as the raging wind howls outside. Aside from being the fourth and final pairing of Bogie and Bacall, Key Largo also marked the fifth film in which Humphrey Bogart and Edward G. Robinson appeared together, which explains why the banter between them is so sharp. At one point, McCloud is filling the Temple’s in on Rocco’s criminal history, telling them how big Rocco was in the rackets back in the days of prohibition. McCloud then looks at Rocco and says he knows exactly what the gangster wants out of life: "more". Upon hearing this, Rocco’s eyes light up. He does indeed want more, and realizes that "more" is all he ever wanted. A bit taken aback by McCloud’s accurate description of his past, Rocco responds, “OK, smart guy, what is it you want out of life?” to which McCloud replies, “To live in a world where there’s no room for Johnny Rocco”. Key Largo is chock full of spirited give-and-takes such as this, and thanks to its veteran cast the clever dialogue never misses its mark. And we should mention Claire Trevor, who won a well-deserved Oscar for her performance. Anthony: Absolutely! Hers was yet another great performance in a film chock full of them. I've found I love everything Claire Trevor does. Robert: Thanks for the comment! And I'm with you...Claire Trevor is excellent.